Discovered accidentally while cleaning a wood folding chair on our porch. I think it looks nice in B&W. It was a sunny day - I also got lights and shadows. Spiders leave their webs anywhere they think might be undisturbed! Very nice lighting. Well done with the help of your spider friends. A Nice web-cob. Great using B&W! The lights and shadows are gorgeous! This is cool! Well done! I like Spiders webs !! 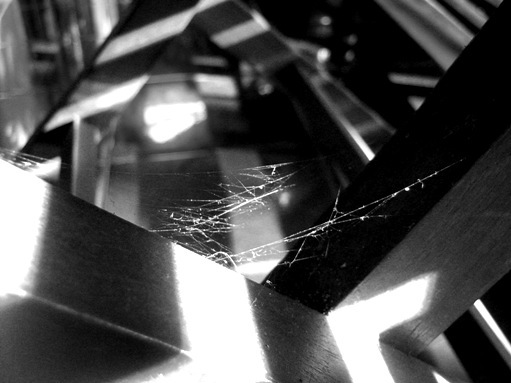 Congratulations for your interesting composition, light and shadow and delicious that spider web! Great shot! The light is very nice in this one. Very nice! The curved lines of the web are nicely contrasted by the straight lines in the background. Excellent composition! Great shot of the web! Interesting light and shadows in this b%w photo! Great light and an interesting shot. Beautiful shot! The light is wonderful. ultimate during undertaking smoothie, milkshakes, purees, broth, and thus killer e.
Both have one particular reservoir where in fact the foodstuff is sliced possibly pureed, and there's drive inside your bottom part that is certainly control using a exchange a new line of handles.